Colin Kaepernick has reached a settlement with the NFL over his 'collusion' case against team owners. 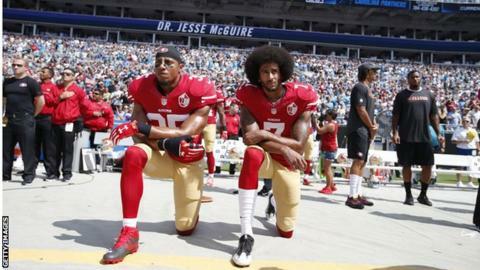 On Friday, their lawyers and the league released a joint statement, saying the pair had been "engaged in an ongoing dialogue with representatives of the NFL" over recent months. "As a result of those discussions, the parties have decided to resolve the pending grievances," the statement read. "The resolution of this matter is subject to a confidentiality agreement so there will be no further comment by any party." A statement from the NFL Players Association said: "We are not privy to the details of the settlement, but support the decision by the players and their counsel.